So you have a word wall and you are not sure what to do with it. Well, you are in the right place. Putting up a word wall in your room is pointless if you don't teach your students how to use it. That requires you to teach HOW to use the word wall. 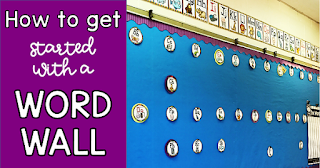 In this post, I am going to give you lots of suggestions for teaching your students how to use the word wall. The best part is that it doesn't have to take a lot of time. I hope you have come to me after visiting my two previous posts on setting up and using a Word Wall. If you have not, you might want to check them out first. 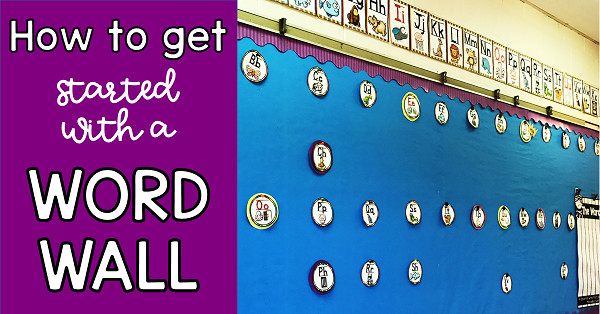 This post is all about setting up your word wall. It answers questions about getting started. Click on the image to head there. 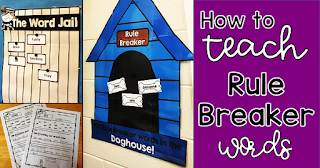 In this post I share how I introduce my words and why I think you need to highlight the rule breaker words that you teach. A Word Wall is just a bulletin board in your classroom unless you actively use it daily and teach your students how to use it. 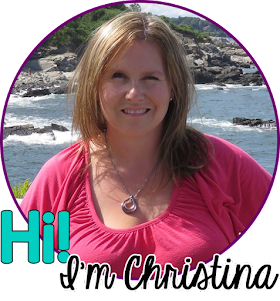 I am going to share with you some of my favorite ways to provide daily review of the words with just a few minutes every day. If you have read any of my previous posts you might know that I am a bit obsessed with whiteboards. I LOVE them! Practicing our Word Wall words is very important but I don't need a piece of paper to see what the kids are doing. This is a much better alternative and a win-win for me. Besides, I don't know about your students but using whiteboards and markers makes everything a lot more fun. We play a number of simple games each week to review the words. This is a whiteboard activity I usually do on Tuesday to ensure that my students know where to find the new words on the Word Wall. The words are still in the popcorn bucket but I ask students to look at the Word Wall instead to find the words. Once they have had a chance to write the word one student comes and points to the word with one of my magic reading sticks and the other students all hold up their boards to show their work. If the word is also in the Word Jail I make sure to have a volunteer show us where it is. To challenge those stronger students early in the year I ask some students who I know are capable to find and then print the word in a sentence instead of just printing the word. By mid year this is the norm for all of the students as a means to practice our weekly words. This is a game I believe came from the 4 Blocks series by Pat Cunningham. This one is a bit more complicated. I sometimes pair stronger with weaker students to play this so that those students don't get frustrated. How to play: I pick a word from the Word Wall in advance of the game and prepare 3 clues that will help the students guess the word. I give 5 clues in sequence and they write their guess after each clue. It is probably easiest to show you. Clue 4 - My word has the bandit Y sound at the end of the word - That is what we call the Y at the end of a word that steals the sounds of I and E.
Clue 5 - It is always a sentence that uses the word in it to confirm that they got it. When a joke is _____ I always laugh. 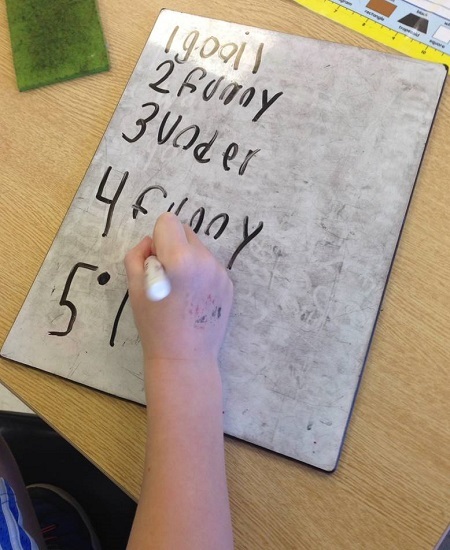 When they are finished they will have 5 words written - if they guess it early on they can keep writing the word or they can change it each time. It is a fun game but you really have to emphasize that the point isn't to get the word the first time out but to use the clues to help. 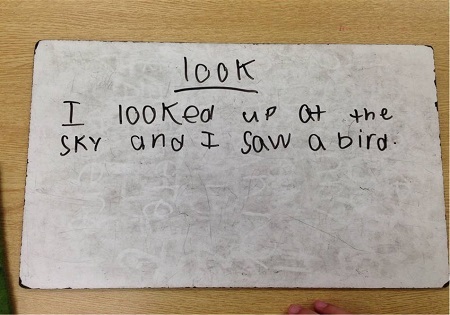 This is not a whiteboard game but it is a good one to get them to listen to the sounds in the words. I say the Word Wall words slowly and enunciate every sound like a robot. They guess my word and then go and find it on the Word Wall to show everyone. I love having my students working together to practice their word wall words as well. They listen very well to "student" teachers, sometimes better than to me! You can read more about my Word Wall Pockets by clicking on the image below to go to that post. 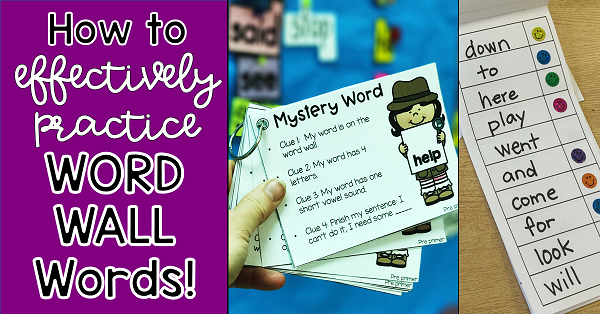 All of these activities require the students to actively use the Word Wall. 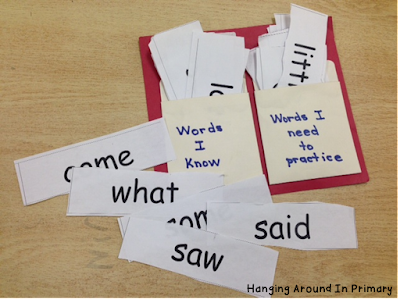 By playing these simple games you are teaching students how to find words and how to scan the Word Wall for the words they are looking for. You are training your students to use the Word Wall so that when it is time for them to do some independent writing they will hopefully use it without prompting. After years and years of teaching, I know that a Word Wall helps students develop their sight vocabulary but only if you put in the time and effort to use it. It also works for my most struggling students. I would often find them standing right in front of the Word Wall looking for a word they needed. Looking for more ideas that pertain to the Word Wall and word work. Check out my pinterest board for more ideas. 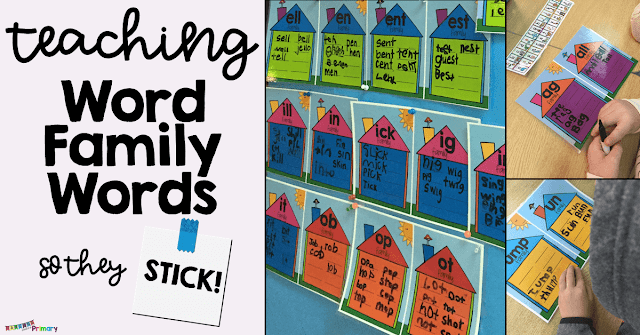 Head over to the next post to find out how I teach Word Families, a crucial part of my Word Wall and Word Study. Love the idea of Word Jail! My firsties would love it! Thanks Susan. I am glad you stopped by! Great idea! Thanks for linking up your post with mine toay! You are welcome. Thank you for checking out my post. I just love these ideas! Thank you for sharing. Thanks Najda! I am glad you stopped by to check it out! Awesome tips! I wish I had room in my classroom for a word wall! All I can do is put the words on rings and make it portable, but I am totally buying the word jail! Thanks! Just curious - as you introduce the new 5 words for your word wall, is the introduction the same each week? On Monday you use the popcorn words and have them say it silently in their hand. What about Tuesday, Wednesday, Thursday, and Friday? Do you repeat the same activities each week? Hi Constance, I do introduce them the same way every week. Then on Tuesday-Friday we play some of the word wall games I have suggested but I also do some word family work too. I will be posting all about that very soon so be sure to follow my blog so you don't miss it. So I guess I've just had a bulletin board all these years! I'm finally ready to make the jump to USING my word wall thanks to these ideas. I can't wait! I am so happy to hear that! If you don't "use" it with your students they they don't don't really use it, especially those strugglers. Good luck. Thanks for sharing! I used to do a word wall, but it just always seemed like a fail because my students didn't interact with it like they should. Thank you for your great ideas! Maybe I can get a word wall up and running this year! Hi Jamie. Interaction with the word wall is the key. They need ownership over it to buy in and I assure you if you do the things I outlined in this series you will get them to buy in and use it. Good luck this year! Thanks for the great ideas. Have been teaching Grades 1 and 2 for 22 years. I have used a Word Wall for the past 15 years and think it is a necessary tool in teaching students sight words. I have always struggled with how to get my students to use the Word Wall for more than just a space to hang their spelling words on. I usually start the year off well, but after a few months, revert back to my old ways. I am determined to do better this year, so thanks for the ideas. Im a new teacher this year, and found this series of posts very helpful. I now know exactly how to start introducing my words on my word wall. Thanks a bunch. What a wonderful idea. I am homeschooling a first grader who hasn't got her letter names/sounds down yet, and a 5th grader who struggles with spelling and spelling rules. This is a fantastic idea to make repeated exposure to the words fun, and they can work together to do some of the activities. Now all I have to do is figure out where to put it! Thanks so much for the work you've put in to bring this idea to as many teachers as possible. Hi Merle, Thanks so much for your kind comments. I hope that some of the ideas will help both of your children. Repeated exposure is the key, as well as consistency! Good luck and thank you for checking out my blog.